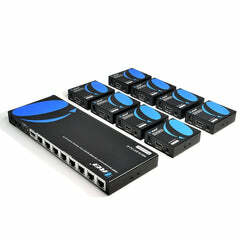 Distribute 1 HDMI source to 8 HDMI displays over Network Cable Simultaneously. 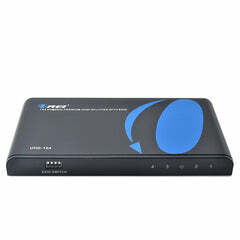 HDMI Transmitter is equipped with 8 Port CAT6 Output. And 1 Additional HDMI Output to connect to a local display or monitor. IR Remote Control. Supports 20~60Hz IR Pass Back, Control a DVD Player or Other HDMI Video Source from a Remote Location with the included IR cables that forward commands over a ddedicated DDC Channel. Plug & Play Setup without any Software Installation. Compatible with CAT6/6a/7 Network Cables. The highest Resolution Supported is 1920×1080@60Hz, Ideal Solution for HDMI Exhibition, Video Conference, Meeting rooms and Bars,, ect. Split one HDMI input signal to eight HDMI output signals identical to the input signal without any loss in quality. 1 Input source such as a Blue Ray player can display on to 8 source to 8 TVs. Connect the Transmitter to an HDMI Camera and the Receiver to an HDMI Monitor, Power the transmitter with a Micro USB Cable to the laptop or Even a Power Bank. Convenient remote control allows you to select any inputs on any output displays. IR Allow source device to recognize remote commands; You are able to control the HDMI source device at a secondary location with the included IR cables that forward commands over a CAT5e/6/7 cable. It can transmit HDMI 1080P signal to above 100M (330FT) by using UTP Cat5e6. 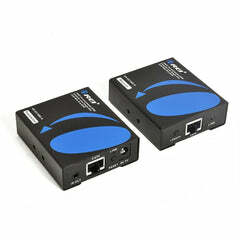 Designed to convert HDMI signal to standard TCP/IP and transmit by internet cable or Lan. Uncompressed Signal for Zero Latency, EDID Management function for working compatible with some unusual TV/monitor. Support:HDMI 4K@60Hz HDMI 4K@30Hz, 480i 60HZ, 480p 60HZ, 576i 60HZ, 576 50HZ, 720p 50/60HZ, 1080i 50/60HZ, 1080P 50/60HZ, 2050Khz Supports 3D andLPCM,Dolby-AC3, DTS7.1, DSD/Dolby /DTS-HD master audio, Essentially all available audio options are supported.